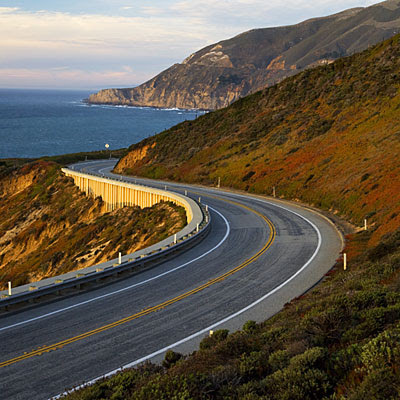 Recently I've been mapping out our family's upcoming journey on Highway 1 along the California coastline. I've never even stepped foot in California, so I'm probably the last person who should be mapping out our journey. But alas, the responsibility has fallen upon me. I have a gazillion different tabs opened on my computer right now, all displaying various bits of information about our proposed journey. We're looking into traveling to California via Amtrak, so I have a half dozen tabs displaying various Amtrak schedules, routes, pricing charts, etc. I need to know what to see along the coast of California, so I have a variety of Suite101.com articles open that tell me where to eat, where to see whales, where to lodge, how long to allow ourselves for the drive, etc. I need to know where I can get cheap, but reasonably decent hotels, so I have Travelocity, Priceline.com, and Hotels.com all working hard for me. And I'm trying to map out our journey in a reasonable fashion so I don't have two teenagers whining about the amount of time we're spending in the car, so I have Mapquest showing me exactly how long it's going to take to get from point A to point B to point C...you get the picture. And don't worry, I realize I need to allot extra time beyond what Mapquest is indicating so we can actually stop and look at the Pacific Ocean instead of just zooming past it. I spent almost four hours on my travel plans yesterday afternoon and still have not sat down with James to finalize anything. At this point it's all still a pipe dream, yet I've poured hours into it and crowded my brain with endless facts, opinions, options, suggestions, highlights, schedules, and dollar amounts. I've put a lot of work into mapping out this trip and I'm not even sure it's going to happen. So why do I bother? Because I want to take the right path. I want our trip to include good things, beautiful sites, restful stops, ease of travel, safety, conservative pricing, and joy. I don't just want to get from point A to point G; I want to enjoy the journey. If I'm willing to spend a full afternoon plus who-knows-how-much-more-time mapping out a journey up the California coastline, shouldn't I be willing to spend a little time and energy seeking the right path for life? After all, there's so much more at stake than time and dollars. The Bible teaches that there are options for the path we choose in life as well. It takes intent and discipline to get on the right path, but it's well worth it. Just like the right path for my family's vacation produces benefits in the way of cost savings, beautiful vistas, safety, and general enjoyment, choosing the right path in life yields important benefits too. If you want to enjoy life, navigate it safely, get to your chosen destination and accomplish what you've set out to accomplish, you're wise to consider the path you take carefully. So how do we get on the right path? We consider our path carefully. We put some time into studying God's manual for the journey, the Bible. We diligently seek His wisdom because, after all, He knows the path better than anyone else - He forged it! We ask Him daily where to plant our feet. And we wait on His timing before moving forward. I'm going to keep planning my family's trip to California and if you have any helpful tips, I welcome those. But I'm also going to spend some time contemplating the path I'm on in life. I invite you to do the same and to share with us what you are doing to make sure you're on the right path. Do you have a daily briefing with God? Is there a particular request you pray each day as you get on the path? Specifically how do you use God's Word as a navigational tool? What part do other people's journeys play in the planning of your own? I'd love to hear from you today!